Happy Monday. AP and I just returned from a week long excursion through New England, and it was glorious. We celebrated his grandmother’s 90th birthday with family in the Berkshires, headed to Boston for a few days and enjoyed some of our favorite bean town establishments, headed up to Portland, Maine, then finally up to Little Cranberry Island off of Bar Harbor. Finally, we returned to NYC and spent the weekend with my family taking advantage of the empty city, and eating at my sister’s restaurant where she is a pastry chef! Was so fun. 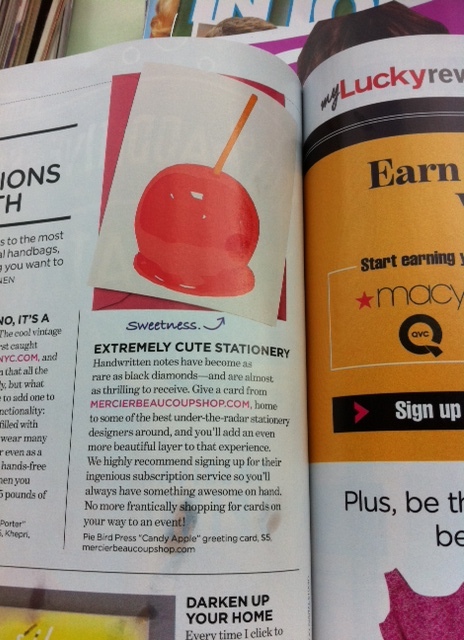 I was delighted to come back and see that the Stationery Shop made it into the August issue of Lucky Magazine! Check it out in the Web Obsessions section. Here is a pic to tide you over until I scan a real copy of the feature.